I have been wearing Olive green so much lately. I really love it for Fall. I can't seem to stop buying things in this color. It goes with everything. I love how long this top is. It would be great with leggings. Happy hump day.Thanks for stopping by. 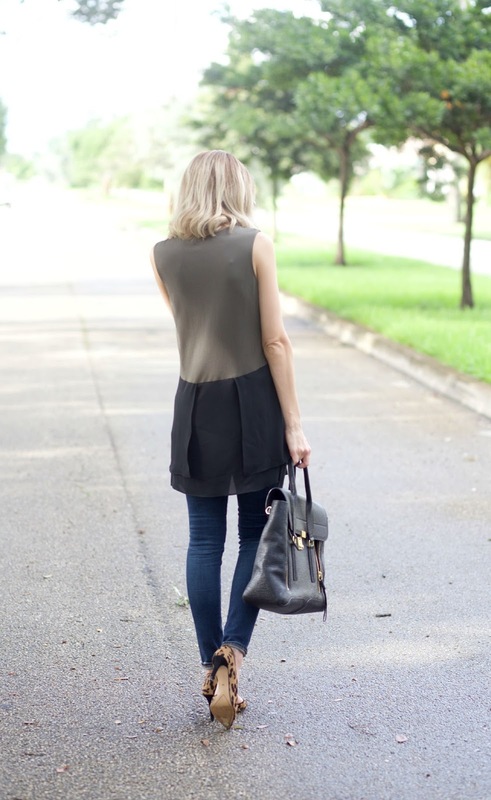 I love the olive green with the black colourblocking shirt. I am also loving olive/army/emmerald greens lately! The gold necklace looks really great with it. my favorite combo as of late! Amazing top! I love how you styled it!! Looking fierce!! I love the mix of neutrals!! Love the olive green, black, and leopard combo. You've done a great job styling this outfit! Lovely photos too! You look great! Hope unpacking is going good! Such a pretty Fall outfit! Love the colors and the necklace! http://trendkeeper.me.. Fall Wishlist & my giveaway! I have been obsessed with this Olive green color too! It's such a lovely shade and perfect for fall. You look great in this look, love how you accessorized it! Your necklace is beautiful, love it :) Also, that picture of you looking at your daughter is just precious! Love your top, so chic! I love that tops its super cute! You look great. I love that you have your stroller in the picture! Love your look head to toe! Any comments or suggestions would be helpful! Thank you for always finding the time to post and be inventive with your wardrobe. I love your blog!